Roughly circular in shape, the largest bay on the NSW coastline is Jervis Bay. Almost 10 kilometres wide (east to west) and just over 15 kilometres north to south, the bay has a mouth 5 kilometres across. While the land to the immediate north, west and south is fairly low lying, the east side of the bay is composed of enormous sandstone cliffs that rise up from the sea to create the bay. The dramatic cliffs give way to an even more dramatic undersea terrain which drop away to well over 40 metres, in some places only 50 metres off the shore. Located just over 180 kilometres south of Sydney by road, Jervis Bay is a piece of NSW that has been largely undisturbed by development. Like Sydney Harbour, a large section of the land surrounding Jervis Bay is under the control of the Australia military, in this case, the Royal Australian Navy. As strange as it may seem, this has led to the bay being protected from development. Despite having a naval bombardment range on one section of the bay and coast and being originally proposed for a nuclear power station, the bay is now almost totally protected from further development. The majority of land around the bay is now either part of the NSW Jervis Bay National Park, the Federally run Booderoo National Park (it used to be also called Jervis Bay National Park meaning there were two!!!) 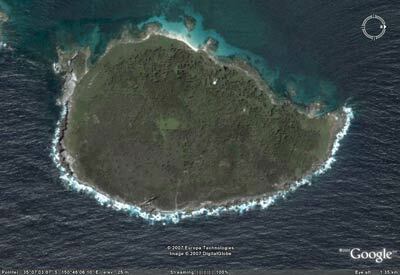 or the navy base and bombardment range. In poor weather conditions, the winds and seas generally come from the south so the only protected area at Jervis Bay is the northern end of Bowen Island. In these conditions, the only spot open to diving is the northern end of the island. Depending on the seas and exact direction, the only spots that can be dived are Little Egypt, North Bowen Island and The Nursery. While the whole of the northern end of Bowen can come under the description of North Bowen Island, I use this term to cover the section of coast from about 100 metres from the north-eastern point to about 300 metres. Anchor anywhere in this area, using your depth sounder to pick out a depth of about 20 metres in which to anchor. The bottom in this area consists of many small boulders with some larger ones. They are covered with sponges, gorgonias and sea squirts, nothing spectacular, but interesting. In between the rocks there is some kelp growth. When you start the dive, head down to the sand edge which is about 24 metres where you first strike it. The sand has a lot of boulders on it and the depth actually drops away to over 27 metres on the other side of the boulders. They extend out up to 30 metres from the main reef in some spots. In among the boulders and along the reef edge there are many sea dragons. I have seen up to 10 along here, including some deformed ones. Other fish seen here include many squid (I have seen them on most of my dives), kingfish and many species of leatherjackets. After a time at depth, head in towards the shore. Here the reef is truely spectacular, with huge boulders creating small canyons and swim-throughs in the shallower sections. 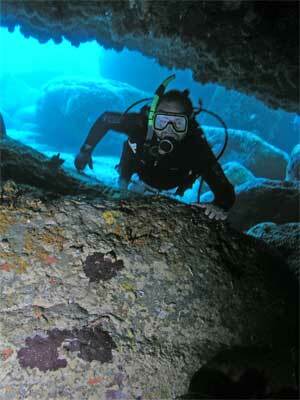 The depth here ranges from 5 metres down to 10 metres under the boulders. The fishlife is prolific, with yellowtail, one-spot pullers, seapike, bream, luderick, blackfish been the most common. I have also seen a very large ray on most dives here. I always spend a lot of time exploring the caves and swim-throughs, checking out every nook and cranny. It is great fun to swim in and out of the caves. Photographers can get some very good shots looking out from the larger caves.